This directive is not new. 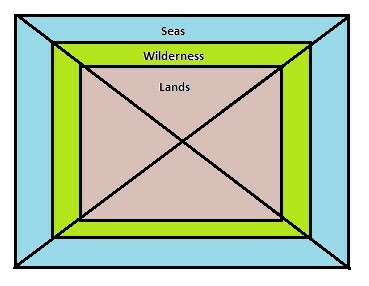 A 2012 curriculum manual contains an abstract diagram of the lands of Zarahemla and Nephi with the caveat, “As you use this diagram, explain that the Church has no official position about Book of Mormon geography except that the events occurred in the Americas.” LDS leaders and writers have cautioned many times for over a century against placing too much confidence in any particular theory about the lands where the Nephite civilization was located. Although the directive expressed in the new essay is not itself new, the essay makes some noteworthy statements, as we shall see. One might wonder why the LDS Church is unable to take any sort of stance regarding the geography of the Book of Mormon. Is this reticence due to some uncertainty about the exact locations of specific cities or the precise sites of specific events? Is it because they have a generally good idea where the Nephites lived but cannot pinpoint the location of the city of Bountiful? Not at all. Rather, the LDS Church refuses to commit itself to any “Book of Mormon geography” because Mormons are currently sharply divided among themselves as to the general part of the world where the Book of Mormon civilizations supposedly lived. As the statement quoted above from the 2012 manual indicates, the only thing the LDS Church confidently asserts is that the Book of Mormon events occurred somewhere “in the Americas.” Beyond that extremely general claim, Mormons advocate widely disparate theories as to the regions of the Western Hemisphere occupied by the Jaredite and Nephite civilizations described in the Book of Mormon. Mesoamerican models place the entire civilizations of the Book of Mormon within a part of Central America (usually in what is now Guatemala and southern Mexico). The Heartland model places the Book of Mormon civilizations in North America, especially around some of the Great Lakes and in the Mississippi and Ohio river valleys. The Andean model identifies the Book of Mormon lands as South America, with the major civilizations largely along the Pacific coast (Peru, Chile, and Ecuador). To put these differences in perspective, imagine Christians strenuously debating among themselves whether the ancient nation of Israel occupied the entire Mediterranean region (southern Europe, the Near East, and North Africa), the Italian peninsula, southern Arabia, or a thin Mediterranean coastal strip in the Levant. Imagine being unsure whether ancient Jerusalem was in modern-day Israel, Yemen, or France. This is a fair comparison, since Mormons debate whether the Book of Mormon location called Cumorah was in upstate New York, southern Mexico, or the Andes mountains near Ecuador. Upstate New York and Ecuador are more than 3,000 miles apart by air and over 4,000 miles apart by land. Is it not the case that there is uncertainty about many biblical locations? Yes and No. Yes, there is uncertainty about many specific places mentioned in the Bible, mostly small villages or towns referenced only once or twice in the Old Testament. No, there is no uncertainty about the regions occupied for centuries by the major nations or societies that figure in Old Testament history. Those unidentified villages? We don’t know exactly where they were, but we typically can narrow it down to within fifty or a hundred miles or so (sometimes much less). We know where Israel was. We know where the Babylonians, Egyptians, Greeks, and Romans lived. The most famous specific site mentioned in the Bible for which we have any significant uncertainty as to its location is Ur, Abraham’s ancestral city. Most scholars think it was located in southern Iraq, but there are traditions and theories suggesting locations as far away as eastern Turkey, roughly 800 miles to the north. That’s just one location, from four thousand years ago, about as “bad” as it gets for any historical location in the Bible, and yet it’s five times worse for every place in the Book of Mormon because Mormons themselves place the Nephite civilization in regions as much as 4,000 miles apart. In 1985, when John Sorenson published his landmark book An Ancient American Setting for the Book of Mormon, many Mormon scholars thought he had firmly established a workable Mesoamerican model for Book of Mormon geography. For the past three decades most of the defenses of the Book of Mormon’s historical authenticity coming out of BYU, FARMS (later the Maxwell Institute), FairMormon, and more recently Interpreter presupposed and built on Sorenson’s model or one like it. The LDS Church has a cadre of scientists, archaeologists, anthropologists, and historians passionately interested in validating the Book of Mormon, most of whom advocate some form of Mesoamerican model. Yet instead of this model gaining ground and becoming the dominant view it has if anything lost “market share” among Mormons in the last twenty years or so. The “Heartland model” especially enjoys considerable, enthusiastic support from many rank-and-file Mormons and is supported and promoted through conferences, videos, websites, books, and even tours to locations thought to support this alternative model. After years of vigorous debates between advocates of the Heartland and Mesoamerican models—with the Andean model seemingly emerging in recent years as a significant alternative—no model appears to be likely to win the day. The LDS Church has therefore reiterated its stance that it has no official view on which of the many models of Book of Mormon geography is correct. The hope that as the evidence accumulated one viewpoint would emerge as clearly superior has faded. Although the LDS Church is officially “neutral” on Book of Mormon geography, it is not neutral on the historicity of the Book of Mormon narrative. It has been a cardinal doctrine of the religion that the Book of Mormon is an authentic collection of texts written by ancient prophets somewhere in the Americas recounting actual events in their history. The LDS Church has stiffly resisted proposals to regard the Book of Mormon as a modern scripture utilizing the fiction of ancient civilizations as the vehicle for conveying spiritual truth. It probably seems unthinkable to most Mormons today that the LDS Church would ever abandon its position that the Book of Mormon is literal, historical fact. However, one should not forget that the Reorganized Church of Jesus Christ of Latter Day Saints (RLDS), decades before it became the Community of Christ, had gone through a transition in which most members went from belief in the Book of Mormon as history to a liberal view of its narrative as inspired, spiritually edifying fiction. Might the same thing happen in the Salt Lake City based LDS Church? Of course, Russell (who is now the Prophet and President of the LDS Church) was not questioning the historical authenticity of the Book of Mormon. Nevertheless, his statement does seem to indicate that its historical content is not essential to its purpose “to testify of Jesus Christ.” It might not be too many steps from this stance to the conclusion that one may question its historicity without losing its gospel message. If it is possible to be “geography neutral” with regard to the Book of Mormon, perhaps it is possible to be “history neutral” as well. For example, “Becoming Like God” has 56 footnotes; “Plural Marriage in Kirtland and Nauvoo,” 53; “Translation and Historicity of the Book of Abraham,” 46; “Book of Mormon Translation,”34; “Book of Mormon and DNA Studies,” 30; “Race and the Priesthood,” 26. “First Vision Accounts” is relatively sparing with just 13 footnotes. “Lesson 56: Mosiah 7–8,” in Book of Mormon Seminary Teacher Manual (2012), 196. This statement was cited in the 2014 Gospel Topics essay “Book of Mormon and DNA Studies” (n. 6). See the series of quotations from 1903 to 1993 at “Book of Mormon Geography and Revelation,” FairMormon (n.d.). John L. Sorenson, The Geography of Book of Mormon Events: A Sourcebook, rev. ed. (Provo: FARMS, 1992), 9-11. John L. Sorenson, An Ancient American Setting for the Book of Mormon (Salt Lake City: Deseret/FARMS, 1985). See especially the website of the FIRM Foundation (Foundation for Indigenous Research and Mormonism), led by Rod Meldrum, at https://BookofMormonEvidence.com. “Policies,” Book of Mormon Central. “Church Releases Statement on Book of Mormon Geography,” Book of Mormon Central, Jan. 29, 2019. Russell M. Nelson, “A Testimony of the Book of Mormon,” Ensign, Nov. 1999. This entry was posted in Mormonism and tagged Book of Mormon, geography, LDS, Mormonism, Sorenson. Bookmark the permalink.